Distribution of the Common Myna. Native distribution in blue, introduced in red. ↑ BirdLife International (2012). "Acridotheres tristis". IUCN Red List of Threatened Species. Version 2012.1. International Union for Conservation of Nature. http://www.iucnredlist.org/apps/redlist/details/106006823। আহৰণ কৰা হৈছে: 16 July 2012. ↑ myna. CollinsDictionary.com. Collins English Dictionary - Complete & Unabridged 11th Edition. Retrieved October 06, 2012. ↑ 4.0 4.1 4.2 Lowe S., Browne M., Boudjelas S. and de Poorter M. (2000). 100 of the World’s Worst Invasive Alien Species. A selection from the Global Invasive Species Database. The Invasive Species Specialist Group (ISSG), a specialist group of the Species Survival Commission (SSC) of the World Conservation Union (IUCN), Auckland. ↑ Rasmussen, PC & JC Anderton (2005). Birds of South Asia: The Ripley Guide. Vol 2. Smithsonian Institution & Lynx Edicions. পৃষ্ঠা. 584. ↑ 6.0 6.1 6.2 6.3 6.4 6.5 6.6 6.7 6.8 6.9 Ali, Salim; Ripley, S. Dillon (2001). Handbook of the Birds of India and Pakistan, Volume 5 (2 (paperback) সম্পাদনা). প্ৰকাশক India: Oxford University Press. পৃষ্ঠা. 278. ISBN 0-19-565938-4. ↑ 7.0 7.1 Rasmussen, Pamela C.; Anderton, John C. (2005). Birds of South Asia - The Ripley Guide (volume 2). Smithsonian Institution, Washington & Lynx edicions, Barcelona. পৃষ্ঠা. 683. ISBN 84-87334-66-0. ↑ 8.0 8.1 "Common Myna". http://www.oiseaux.net/birds/distribution/common.myna.html। আহৰণ কৰা হৈছে: December 23, 2007. ↑ Pande, Satish (2009). Latin names of Indian birds explained. প্ৰকাশক Mumbai: Bombay Natural History Society and Oxford University Press. পৃষ্ঠা. 506. ISBN 978-0-19-806625-5. ↑ Griffin, Andrea S. (2008). "Social learning in Indian mynahs, Acridotheres tristis: the role of distress calls.". Animal Behaviour খণ্ড 75 (1): 79–89. doi:10.1016/j.anbehav.2007.04.008. ↑ Mahabal, Anil; Vaidya, V.G. (1989). "Diurnal rhythms and seasonal changes in the roosting behaviour of Indian Myna Acridotheres tristis (Linnaeus)". Proceedings of Indian Academy of Sciences (Animal Science) (Indian Academy of Sciences, Bangalore) খণ্ড 98 (3): 199–209. doi:10.1007/BF03179646. http://www.archive.org/details/MynaRhythms। আহৰণ কৰা হৈছে: 22 January 2011. ↑ Choudhury A. (1998). "Common Myna feeding a fledgling koel". Journal of the Bombay Natural History Society খণ্ড 95 (1): 115. ↑ Mathew, DN; Narendran, TC; Zacharias, VJ (1978). "A comparative study of the feeding habits of certain species of Indian birds affecting agriculture". J. Bombay Nat. Hist. Soc. খণ্ড 75 (4): 1178–1197. ↑ "Ubiquitous Javan Myna". Bird Ecology Study Group, Nature Society (Singapore). Besgroup.blogspot.com. http://besgroup.blogspot.com/2005/12/ubiquitous-javan-myna.html। আহৰণ কৰা হৈছে: October 25, 2007. ↑ Wilme, Lucienne (1996). "Composition and characteristics of bird communities in Madagascar" (PDF). Biogéographie de Madagascar: 349–362. http://horizon.documentation.ird.fr/exl-doc/pleins_textes/pleins_textes_6/colloques2/010008477.pdf. ↑ "ABC Wildwatch". Abc.net.au. http://www.abc.net.au/tv/wildwatch/results/award.htm। আহৰণ কৰা হৈছে: 2012-08-07. ↑ 17.0 17.1 Hone, J. (1978). "Introduction and Spread of the Common Myna in New South Wales". Emu (Royal Australasian Ornithologists Union) খণ্ড 78 (4): 227. doi:10.1071/MU9780227. http://www.publish.csiro.au/?act=view_file&file_id=MU9780227.pdf. ↑ Martin, W.K. (1996). "The Current and Potential Distribution of the Common Myna Acridotheres tristis in Australia". Emu (Royal Australasian Ornithologists Union) খণ্ড 96 (3): 169–170. doi:10.1071/MU9960166. http://www.publish.csiro.au/?act=view_file&file_id=MU9960166.pdf. ↑ Vikki, By (2009-05-12). "Councils assessing backyard traps to catch Indian Mynah birds | thetelegraph.com.au". Dailytelegraph.com.au. 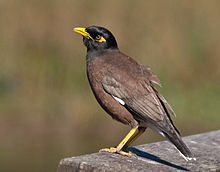 http://www.dailytelegraph.com.au/news/councils-assessing-backyard-traps-to-catch-indian-mynah-birds/story-e6frezt9-1225711964693। আহৰণ কৰা হৈছে: 2012-08-07. ↑ Derick S. Peacock, Berndt J. van Rensburg and Mark P. Robertson (2007). "The distribution and spread of the invasive alien Common Myna, Acridotheres tristis L. (Aves: Sturnidae), in southern Africa". South African Journal of Science খণ্ড 103: 465–473. ↑ Pande, Dr Suruchi. (2007). Some reflections on birds in Sanskrit literature. (A Thesis submitted for the degree of Vidyavachaspati (PhD) (Sanskrit) awarded from Shri Balmukund Lohiya Centre of Sanskrit and Indological Studies, Tilak Maharashtra Vidyapeeth, Pune). ↑ Dave, K. N. (2005). Birds in Sanskrit Literature (revised সম্পাদনা). প্ৰকাশক Delhi: Motilal Banarsidass Private Ltd. পৃষ্ঠা. 516. ISBN 81-208-1842-3. (Indian Myna =) Common Myna - Species text in The Atlas of Southern African Birds. "Acridotheres tristis". Integrated Taxonomic Information System. http://www.itis.gov/servlet/SingleRpt/SingleRpt?search_topic=TSN&search_value=554025। আহৰণ কৰা হৈছে: 23 February 2009.